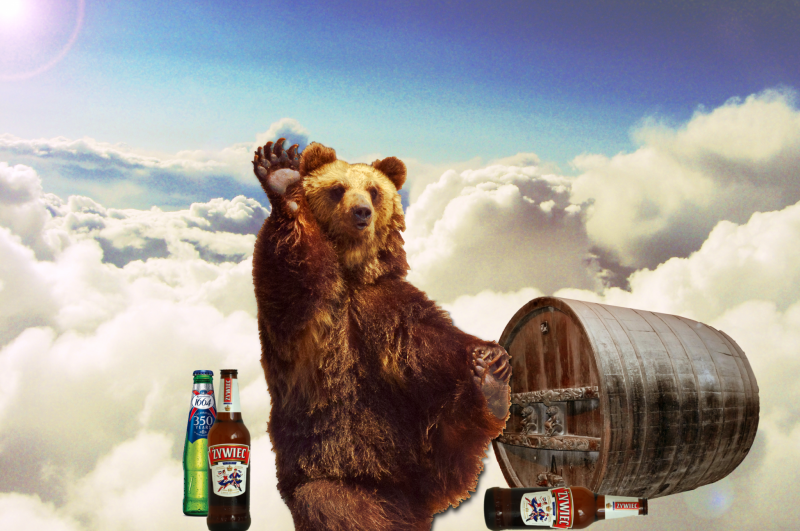 Many of us are familiar with the story of Wojtek, the beer-drinking, cigarette-chomping bear who helped carry ammunition as a soldier with the Polish 2nd Corps of General Anders in the Italian campaign. At the time of writing, a statue of him is due to be unveiled in Edinburgh, where he spent his final years in peaceful retirement after he was demobbed from the army. The Krakow Post has gained exclusive access to the celestial diary which Wojtek started keeping after his promotion to paradise. MONDAY – It’s another beautiful day in paradise. I’m lounging by the pool, hanging out with my cousin bears, drinking ice-cold bottles of beer. What a great selection there is in the fridge in the poolside cabana. We’ve got various Czech, Polish, French, Japanese, Danish, Spanish, Canadian and Irish beers, to name only a few, but my favourite must be the Italian, since, apart from the taste, it brings back memories of that bel paese. The pool is surrounded by a riot of colour: there are pots of red and purple petunias, scarlet-flowered oleanders, rockeries in front of ornamental grasses and shrubs, fuchsias and azaleas, orange and lemon trees. There is always something flowering because this is heaven, after all. If it gets too hot for me, then there’s either a dip in the pool or maybe a Marx Brothers film or similar in the air-conditioned cinema. Will put down my pen for a minute and catch some rays. TUESDAY – Another gloriously sunny day. Not a cloud in the sky. I was called Wojtek, by the way, by the soldiers of the exiled Polish Army, who took care of me during the unspeakable madness which historians have called World War Two, but my actual name cannot be written in human script. Still, I’m happy to be known as Wojtek and although I have never set foot (or paw) in Poland I will always feel a close connection with that country and its people. In fact, here in heaven, apart from drinking beer and swimming in the pool, I have been practising my Polish with some recent arrivals, such as a famous Polish pope. When he arrived, he was immediately button-holed by some old-timers like the two Thomases Moore and Aquinas and when they started discussing theology, that’s when I had to bow out because they conducted their debate in Latin and that particular language was never my forte. Still, I might take some lessons sometime. Virgil is here, after all. (Sponsored by Dante Alighieri. Or was it the other way round?) As for theology, I prefer not thinking about all that stuff. This is clearly a pretty inclusive place but why can’t it be just as blissful for everybody back on earth as it is here? These questions just make my head ache. I need a cold beer. WEDNESDAY – What a beautiful morning. Another clear blue sky with not a cloud in sight. It’s positively heavenly here, as you would expect, although the distant hum of traffic arriving from purgatory was a bit of a surprise, since I thought that purgatory was discontinued (or was that limbo, and, if so, what was the difference?). I must remember to bring up the subject the next time I see some saints. Or maybe not. Time for a dip since it’s getting hot already. Lunchtime: There is the usual crowd in the Bear Garden. (This was originally spelt “Beer Garden” but the spelling was changed by none other than William Shakespeare, apparently as a nod to us bears and also perhaps by way of making amends for his famous stage direction “exit pursued by a bear”. Perhaps he realizes that we bears have feelings, too. We can be very sensitive creatures, especially after a beer or two). I can see Dante, Mozart, Beethoven and a few others tuning in to the sports channel. Looks like they’ll be watching the Euro qualifiers. Meanwhile, under a shady tree Shakespeare, Dickens and Jane Austen are deep in discussion about the merits or otherwise of various filmed versions of their respective works over what looks like flagons of English ale. Speaking of films, I’ve been catching up on some which I never got a chance to see in my lifetime, since we animals, with very few exceptions – such as guide dogs – were not allowed in cinemas. Bit disappointed with ‘Animal House’ since I thought it would be all about animals. Still, Blutarsky’s ‘Pearl Harbor’ pep talk was gloriously incomprehensible. I ought to mention that an angelic being asked me whether I’d be interested in writing my memoirs. Some notable scribes have already offered their services since we bears are not usually known for our writing talents. The previously mentioned Shakespeare has offered to help, but his language might be a bit archaic, as has Goethe, whose style might be a touch too melodramatic. There is also Homer, who would undoubtedly transform my story into a timeless epic. I have yet to decide. THURSDAY – Another beautiful day. Up early for coffee, bacon and eggs and pancakes. On Dante’s recommendation, watched ‘A Night at the Opera’ last night (a divine comedy indeed), followed by a Q and A session with the Marx Brothers themselves. Groucho and Chico both hilarious. Harpo possibly the most serious and articulate. Had several cold beers later with Socrates and Copernicus and we ended up discussing everything under the sun into the small hours, concluding that the only true wisdom is knowing that you know nothing. So I guess that makes me pretty brilliant. FRIDAY – Another fabulously sunny day. Paradise, by the way, is not necessarily a no-smoking zone. Groucho, for instance, can still enjoy his cigars, but the smoke doesn’t bother anyone else. For myself, I gave up eating cigarettes a long time ago and don’t miss the taste in the least. Beer, of course, is another matter and the never-ending supply here is why this place is called paradise. “A bit later, but not immediately after lunch,” replies the poet. “Meglio aspettare. I shall wait until my lasagne reaches the third circle of my digestive system”. So I leave Dante reading Goethe while I drop gratefully into the cool water. SATURDAY – An even more beautiful day in paradise, if that is at all possible. Sitting in the shade by the pool drinking a long, cool beer. Lengthy conversation at lunchtime with St Francis of Assissi, who seems to have an uncommon understanding of us animals, although he does tend to treat me as if I had the intelligence of a bird. (Only joking, Frank). Still, these talks give me a chance to practise my Italian, which I picked up in the Polish Army during the Italian campaign, of course. (As a serving soldier, I might add). Pomeriggio: Just had a heavenly dip in the pool and starting to feel a trifle peckish. I can smell charcoal. Dante must be firing up the barbecue. I have seen the steaks and they are absolutely colossal. Virgil is coming over, apparently, with some vintage Roman ales. I mentioned before, I think, that although I was not born in Poland, nevertheless I usually feel quite Polish and I usually try to take the opportunity to brush up my Polish language skills. But since I spent so much time in Edinburgh Zoo (where the Poles reluctantly left me once their exiled army had been demobilised), I tend to think in Scottish and actually speak – so I’m told, at least – with a distinct Scottish accent. I try to write in conventional English, of course, but I still react instinctively to the Edinburgh dialect. In fact, when Sir Walter Scott said to me the other day “Gies a wee collie buckie”, I involuntarily clobbered the great wordsmith with my right paw. Okay, maybe he was only wanting a piggyback ride, but we bears are not beasts of burden. “Awa’ an bile yer heid,” I said to him. SUNDAY – Many beers at Dante’s barbecue last night. Speaking Polish a lot with Paderewski, Copernicus, Kościuszko, Chopin, Mickiewicz, Marie Skłodowska-Curie and Marian Hemar. The more beers I have, the more fluent I seem to get. Na zdrowie. “Chill, Adam,” I replied. “ One of the good things about this place is that there are no bad vibes or recriminations. Anyway, as it happens, I haven’t actually read your epic poem. I did try once, but my knowledge of Polish just wasn’t up to it”. Paderewski told me that all of this reminded him of his Californian property near Paso Robles, where he had planted his Zinfandel wines. “I often had the sensation, when I lived there,” he said, “of what paradise must be like.” Later that evening the great maestro treated us all to some of his magnificent piano playing. An interesting question came up in the course of the general conversation. Will anyone ever make a feature film about me? The problem would be, I guess, finding a suitable actor to play the role of Wojtek the Bear. My own choice would have been Sean Connery, but I suppose that’s just a bit of vanity on my part. It’s either an actor or a convincing computer graphics job. Ah, well. Wishful thinking, I suppose. It may be only 10 AM but Sunday is a day of rest and I think I might hibernate a bit. Exit, pursued by a hangover. Dobranoc. Hi Wojtek, any Fuller’s Organic Honeydew in the fridge? Anyway, I didn’t know Paddington Bear drinks beer! Then again, I suppose all the best people do these days. You even got James Bond, shaken not stirred, drinking the beer. As for your question: what do you think? This is paradise, man. We got every single kinda beer under the sun. And more. A bit like a certain establishment in Krakow, no names mentioned, ’cause we don’t want to be accused of free product placement, do we? Speaking of which, Norman Davies has a new book out, all about the Anders Army. I don’t know if Wojtek gets a mention, ’cause I haven’t read it yet, but it might be just the thing to put under the Christmas tree for someone. And, by the way, there is a sanity clause. Wojtek the bear was different inasmuch as, for one thing he survived the war and lived to a ripe old age, and for another, he did not share the same fate as all the mules and horses and other animals who were used as beasts of burden or in other roles. Instead he became a true friend and companion to the Polish soldiers who looked after him, and had almost human qualities. Anyone who has had a pet at home will know how an animal can find its way into our affections and become a part of the family. I doubt if a single Polish soldier felt that Wojtek deserved to be anywhere other than heaven after he died. The picture of heaven, of course, as you no doubt realize, is what might be called “an artist’s impression” since we have no reliable witness accounts. Even the report of the next world by Dante Alighieri is biased (too many personal axes to grind). Wojtek’s other hugely significant contribution is that he has come to symbolize all those Polish soldiers who made their way from the gulags in the USSR, through the Middle East and fought their way up the Italian peninsula in a campaign which is usually overlooked in accounts of World War Two. The loyal bear serves as a reminder to many in the West (and even back home in Poland) of the Anders Army, which has, until recently, been in danger of being entirely forgotten. Best wishes to Richard Lucas, therefore, and all those others who are keeping Wojtek’s memory alive.